It’s Friday afternoon, it’s five o’clock somewhere, and it’s time for some more country music lyrics. 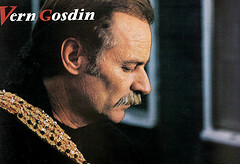 Chiseled in Stone by Vern Gosdin. And I sat there feeling sorry for myself. ’til it’s chiseled in stone. showed me I ain’t nothing without you. Previous PostPrevious Is True/Slant the Future of Journalism?